As with any other organizing project, taming your email in-box involves two distinct phases—the project phase and the maintenance, or habits phase. During the project phase your goal is to declutter your email in-box of anything you no longer need, and then to set up organizing systems so it’s easy to stay on top of your email going forward. Decluttering your in-box simply means deleting, responding and / or filing all of the emails in your in-box. Delete anything that is old and outdated that you know for sure you won’t need to refer to again. Reply to emails that require your response. Keep and file away only those emails you will need to refer back to again and for which you need a record, such as email communications with clients or receipts for paid bills. You don’t need outdated offers from your favorite online retailers, and you don’t need corny jokes from your Mom. You don’t need to keep old articles—if you haven’t had time to read them by now, there’s little chance you’ll have time to read them in the future. So make friends with your delete key and make it your ultimate goal to get to the blissful state of zero emails in your in-box. Wouldn’t that feel great? If this goal seems out of reach, consider these strategies to simplify the decluttering process. Instead of waiting until you have four hours on a Saturday afternoon to tame your email in-box, tackle the project in shorter decluttering sessions. Strive for fifteen minutes a day, or make it a goal to delete or file fifteen to thirty old emails before you hit send / receive for your new emails. 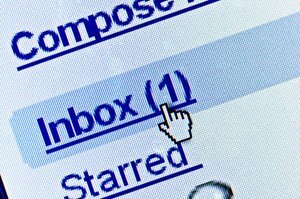 As with physical organizing projects, it’s easier and quicker to declutter your email if you sort first. Luckily, sorting your email is as simple as a click of your mouse, and doing so will allow you to quickly delete a bunch of related emails at once. Sort by subject to make it easy to catch up on and reply to an ongoing email thread. Once you reply, delete all related emails. Sort by sender to easily prioritize emails that need your response and to delete or file emails en masse. As you’re going through your emails and happily decluttering your in-box, make it a point to slow down the future inflow of emails. The fewer emails you get, the easier it will be to stay on top of your in-box going forward. Unsubscribe from mailing lists that are no longer relevant or interesting to you, and those that you don’t have the time to read consistently. Only let into your in-box those emails that you truly enjoy, those you have time to read, and those that are relevant to your current goals and projects. Just like with paper, email folders can provide your in-box order and structure. If your paper filing system works well for you—use the same categories for your email filing system. Or create folders based on broad categories that make sense given the nature of your email. For example, my personal email in-box is categorized by person (one folder for each member of my family) whereas my business in-box is categorized by areas of responsibility (clients, online workshops, marketing, etc.). As you go through your emails, consider which emails don’t need your immediate attention. Then, if your email system has a rules or auto-filing feature, set up rules to auto-file these emails. For example, I have an auto-file folder set up on my computer for coupons and offers. Emails I subscribe to just to find out about sales and specials are automatically diverted into this folder. Then, when I need to shop for something, I check my coupons folder to see if I have any deals waiting for me. This is much more efficient than getting interrupted daily by offers that aren’t relevant to me today. Once you have your email in-box cleared out, the next step is to identify the habits necessary to keep it that way. Instead, make it a habit to read and respond to your emails right away. Checking email involves doing a quick read and then selectively replying to the most interesting emails, leaving the harder ones for later. When you make it a point to read and respond to your email, you’ll save time of reading the same email multiple times…until you decide to respond. If you check your email incessantly throughout the day, work on cutting back this tendency. Email is a huge interrupter, which wastes time in and of itself, but responding too quickly can cause you to get even more emails. Start by becoming aware of how often you check email throughout the day…and then, work on cutting back. By doing so, you may not respond to emails as quickly, but this in turn will cut down on boomerang emails—conversational emails where the recipient replies back as soon as your email hits their in-box. Some emails need time to act on. They may involve multi-step projects that you need to carve out time to do. Or you may need time to make a decision about something in one of your emails. Because of this, it may not be possible to get your email in-box down to zero every single day…but it is a good idea to set a comfortable target for your in-box. Without this limit, your in-box may quickly spiral back out of control. My daily (Monday through Friday) target is to end my work day with just fifteen emails that require my time and attention in the future. Hitting this target requires me to make decisions and respond to emails quickly, which is the best way to keep my in-box under control. Do I hit my target every single day? No…sometimes the inflow is too great. Sometimes things will come up for you, too, making it impossible to hit your target. But by setting a target and working toward it each day you will stay in your email comfort zone much more often. Take action on the concepts in this article to transform your email in-box from a source of stress into a smoothly operating system. I don’t know of a program that would do that. I would explore the functions provided with your email service provider – i.e. gmail, or outlook or whatever you are using. There might be an easy way to delete all built right into your system. Thanks for the tips here is a website that will scan your email, identify subsciptions, and allow you to remove them. (I had over 100).